JMH: What is 'Trista & Holt'? ANDREZ: It's the 1970s, set in an unnamed city, disco is king, and our heroes are members of underworld crime families: Trista is the niece of unmarried matriarch 'Queenie' Marcella Cornwall, Issy the son of Isidor 'Anguish' Holt and his overbearing surgeon-wife Alaina. JMH: Could you describe the world/universe they're from? ANDREZ: Sure — the best way to think of this world is a fusion of 1970s tropes, from it's television programs ('CHiPs', 'Starsky & Hutch') to cutting edge cinema ('Mean Streets', 'Taxi Driver'), and on into disco, flares, mirror balls and kitsch. All of this through the looking glass of a hardboiled crime family drama. JMH: Does 'Trista & Holt' have significant supporting characters — and if so, can you tell CBI about them? ANDREZ: For starters there's Brangien, Issy Holt's best friend and occasional bed partner. She's in love with the man yet he never notices. Governal is Trista's unofficial guardian — he brought her up and trained her to be good at what she does, which is acting as Marcella's confidante and adviser in crises. Moore Holt and the Norwegian are brutal family enforcers for the Holts, and Lou Holden, who acts as their driver, has more to his background than most people are aware of. Then there are the family members: Matriarch 'Queenie' Marcella, dithering Isidor Holt and his power-grabbing wife Alaina, and Trista's broken, alcoholic mother. JMH: Was 'Trista & Holt' inspired by anything from your past or real life experiences? ANDREZ: In a nutshell this yarn is based around the old, old Arthurian legend of Tristan and Isolde — or Tristram and Iseult; their names alternate, and I prefer the latter pairing. As a young kid, I read (and idolized) the Paul Hamlyn-publishedMyths and Legends (1959), retold by Anne Terry White, illustrated by the great Alice and Martin Provensen. I still worship the Provensens' work and still have the book. One reason I prefer to call Tristan Tristram, as that's what they use there. Blame also a healthy dose of re-reading way too much Raymond Chandler and Dashiell Hammett over winter here in Japan. ANDREZ: I grew up with not only the pencils of Jack Kirby and Jim Steranko, but their photomontage/collage work from the swinging '60s — alongside that of Monty Python's Terry Gilliam and Dadaists like Marcel Duchamp and Max Ernst, who were doing the exact same thing a century ago. So the message there is think, and look beyond what you're seeing, hearing or feeling. View the static and bland and mundane for the art they can actually be in the right hands. Other than that, this is one big homage to 1930s/40s film noir, cinema, and hardboiled literature... along with the 1970s. ANDREZ: Easy — that's just me. I write, do art chores, edit, and co-run the publisher IF? Commix [http://iffybizness.weebly.com/] with Matt Kyme in Australia. Mates often do a once-over and pick up on typos, thank god. The other people I'd like to mention are Galo, Kyle and Adam at Under Belly Comics [http://www.underbellycomix.com/] in Canada, who'll be running with the trade paperback of all 15 issues. 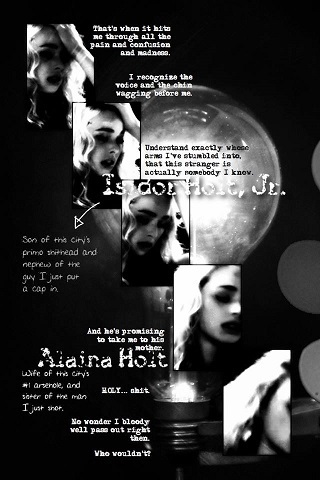 JMH: Will 'Trista & Holt' be released in digital format, web comic, or print? ANDREZ: We print a limited number each month via IF? Commix, and every six months do a trade paperback edition of 5 issues. As mentioned, all 15 will eventually be put together as a trade paperback edition, and that'll be around 350 pages. We also have the digital versions of each issue available through IF? Commix and Dollardownloads online for a buck a copy. ComiXology should be happening soon too. JMH: Where can fans get hold of the series? JMH: Finally, is there anything coming up in further 'Trista & Holt' stories, or other projects you want people to know about? ANDREZ: Well, actually, I'm way ahead on production — we just published #5, but I finished off the series at #15 last week. I'm going through withdrawal symptoms, I swear. So I guess the next project can't be too far away! Otherwise I have my fifth novel coming out, this time via Roundfire in the UK, and it's a supernatural detective pastiche titled 'Small Change'. There's my comic book anthology series 'Tales to Admonish', also through IF?, and the 'Bullet Gal' trade paperback that came out in March through Under Belly — that's a 348-page brute.